This product is for the Electronic (PDF) version of this book. Preview the first 10 pages now. 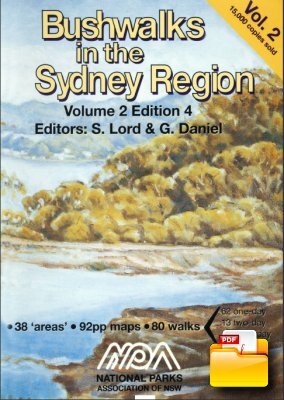 THESE BOOKS (vols 1&2) are the results of the efforts of volunteers to produce two new walks books which would describe interesting walks in the Sydney region and raise funds for NPA. THE SYDNEY REGION: Nominated as an area within 110km radius from Sydney. It includes:- Frazer Park to the N – Glen Davis to the NW – Jenolan Caves & Kanangra Walls to the W – Yerranderie to the SW – and the Northern Part of Morton NP & [nr] Nowra in the SSW. THE WALKS are generally those not covered by other walks books however some classic walks are included such as Valley of the Waters and Blue Gum Forest. There are some walks that have not previously been described. Volume 1 has 93 walks and Volume 2 has 80 walks. THE MAPS are of 1:25000 scale which we considered the minimum for the detail required. Most one day walks fit on a single page map. [The small pocket sized book philosophy was just not good enough]. All maps have True North up and include a compass variation/bearing aid diagram. All maps have a key included. All maps show km guide marks along the route. Spot heights are shown (in metres above sea level) at significant places. Most maps are within 1 page of their respective walk descriptions. Rivers and creeks have direction of flow shown. All maps are in two colours. In many cases the maps and track notes will save having to obtain NP&WS pamphlets, or other maps. THE TRACK NOTES (DESCRIPTIONS). By using several techniques, we fit more text per page than other similar sized books. The notes give directions for getting to starting point of each walk; they also mention where to obtain water, where navigation care is required, (with detailed help), point out where hazards are, and even mention good places to stop for lunch etc. PAPER: The books are printed on paper from sustainable forests. Book size is approx 250x175x10mm thick. Sales of this book help support NPA projects and activities. 2) The PDF can be read on any modern computer, phone or tablet that can handle a PDF of this size. The PDF can also be printed. 3) The PDF will have your email address and purchase details stamped on the margin of most pages of the book. Niche: Many walks in Sydney and surrounding regions. Walking map Comment: Most walks have a unique map.